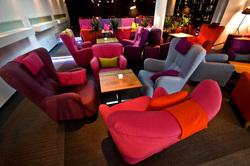 This super-stylish restaurant/lounge/champagne embassy is a swank place to have a few drinks or grab a nice bite. The two floors, prime location and excellent menu make it all that better. Pop by for the many special events, often involving champagne or lingerie - sometimes both, on Friday and Saturday nights. The biggest cocktail bar in Tallinn. The cocktail menu offers cocktails that have won the bar more than 50 international trophies. In addition to the marvelous cocktails, a wide-ranging menu of delicious meals is also provided. The Butterfly Lounge is mainly geared towards a younger crowd that values good cocktail. One of the most interesting and elaborate clubs in Tallinn, Teater takes advantage of its location in an old theatre and certainly provides the club-goer with a theatrical experience. 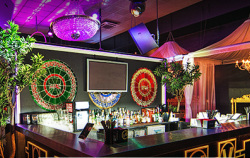 The décor is 1930's-inspired, the large cigar lounge is a nice touch as are the 'showgirls'. Great ambiance, live performances and the opportunity to mingle with an upwardly mobile and more mature crowd. Privé is one of Tallinn's trendiest club destinations. Very cool scene where you'll hear the region's or world's hottest DJs. Great place packed with people ready to party! They have a superb Old Town location and we guarantee you a great night out! The beautiful people, the beautiful people! Vabank is a large nightclub in the Old Town, housed in a former bank building where, currently, many of Tallinn's most beautiful people hang out listening to house and club music. Here you find great cocktails and snacks. It certainly fills a certain niche and often the parties last until the wee hours of the morning. VIP bed-rooms off either side of the dance floor and the private room in the former bank vault.